Argus Heating design, manufacture and stock an extensive range of silicone rubber, PVC, and PTFE heating cables. Heating cables can also be designed and manufactured to suit your specific needs. Our heating cables are available in 100m and 500m dispensing reels, or cut to length when required. 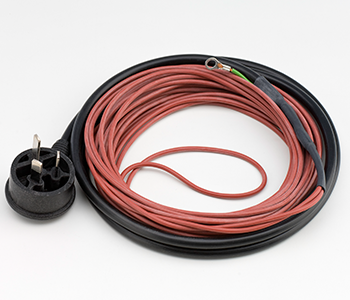 We also provide heating cable assemblies terminated with a variety of cold tail or power cord options. ‍Resistance range of 0.1Ω/m to 6,800Ω/m. Cables made to specific wattage, length and termination requirements. A variety of cold tails and power cord options are also available. Heating cables are available with up to 80W/m. PTFE used for high wattage applications; silicone for medium wattage applications up to 50W/m; and PVC insulation for low wattage applications up to 10W/m. Custom heat cable design and assembly service. Red silicone rubber insulated heating cable has a minimum operating temperature of -32°C and a maximum operating temperature of 150°C. Available in convenient 100m reels from stock and custom made. PVC insulated heating cable has a minimum installation temperature of 5°C and a maximum operating temperature of 105°C. Available from stock and custom made. PTFE cable has a minimum installation temperature of -5°C, and a maximum operating temperature of 250°C. Our custom made PTFE insulated heating cable meets Standard IEC60800 Ed 3.0 2009-07 (Heating cables with a rated voltage of 300/500V for comfort heating and prevention of ice formation). ‍Resistance wire wound in a spiral, around a flexible fibreglass core or bunched resistance wire. Silicone, PVC, or PTFE insulation with others available on request. A braid and sheath are also available. Our heating cables are available in 100m and 500m dispensing reels, or cut to length. Assemblies can be terminated with a variety of cold tail or power cord options.